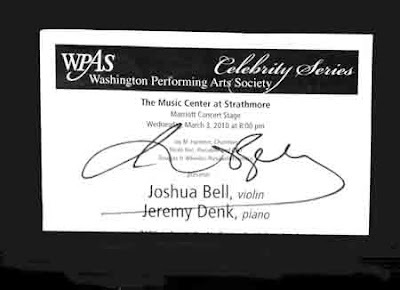 I attended a fantastic concert featuring Joshua Bell and Jeremy Denk earlier this month. I've heard Bell show off his pyrotechniques and his own cadenzas in violin concertos with symphony orchestras, but this performance of chamber music was very different. It is only recently that I've developed a taste for chamber music, and this concert went straight to my heart. The program featured four very different pieces of music. The first piece was Bach's Sonata No. 4 in C minor for Violin and Keyboard, BWV 1017. This piece was soooo Bach. The musicians made it sound gentle, light, and smooth. Hearing it, I felt like I could just let go and float along. The second piece, Grieg's Violin Sonata No. 3 in C Minor, was a substitute for what was written on the program. It was a very strong contrast to the Bach. It was positively wild and electrifying. Its moods were intense, loaded with energy, and constantly changing. Next was Schumann's Violin Sonata No. 1 in A minor, Op. 105. I have never been much of a fan of Schumann's chamber works for violin, and this was no exception. Bell and Denk played it quite well, but that piece just doesn't appeal to me. The final piece, Ravel's Sonata in G Major for Violin and Piano, really captivated me. After years of listening to Ravel's Bolero, I had thought I didn't like this composer, but fortunately, I started listening to his other works. In fact, lately I have been listening over and over to the album "French Chamber Works," which includes Ravel's Piano Trio in A Minor performed by Joshua Bell, Jean-Yves Thibaudet, and Steven Isserlis, and I love the recording. According to the concert program notes for Ravel's Sonata for Violin and Piano, Ravel wrote "...I wrote a Sonata for violin and piano, two incompatible instruments whose incompatibility is emphasized here." Ravel's Sonata is also well known for its second movement, "Blues," which Ravel also described as "jazz as seen by a Frenchman." This music absolutely captivated me. I relinquished control to it. I had been disappointed by an experience which had occurred a few days before the concert. It was not a major issue, but it was bothering me. I had told myself to stop thinking about it. However, when Ravel's music captured my soul, I let go and allowed myself to feel the disappointment from my recent bad experience. By the end of the piece, I had tears in my eyes. I had done some active grieving, and I felt better for it. Of course, the audience applauded enthusiastically, and of course, there was an encore. Joshua Bell spoke through a microphone and I could only hear part of what he said. He told us that he was going to play a short piece by Fritz Kreisler. It was a perfect encore piece, sweet and delectable, and Bell played it so smoothly that it didn't even sound technically demanding. At this concert I was interested in seeing how Bell played as a member of a duo. He never seemed to upstage or outdo Jeremy Denk. However, I noticed that Bell never glanced at Denk, but Denk craned his neck around to watch Bell at critical points in the music as if to say, "How long are we going to hold this note?" or "When will we resume playing after this pause?" Besides all the wonderful music I heard, I got and brought home a physical memento of the concert which I'll bring it to my luthier. The staff likes to hang these things up on their walls. Also, it's a nice way of saying "thank you" to them.